Well, I’m a bit behind because of how long I took to write up the Romaine TR, but a couple weeks ago, New England got what may have been the biggest storm it’s gotten all year. About 5″ of rain in 30 hours. 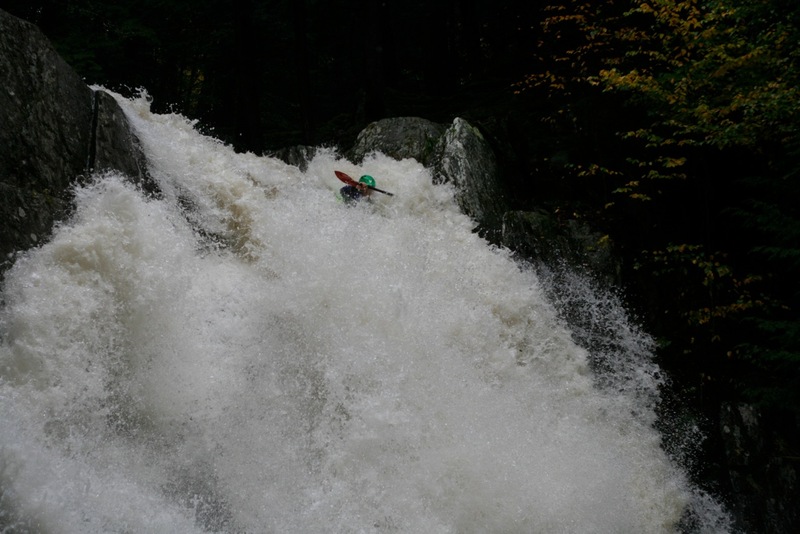 Many paddlers were skunked by the infamous North Branch of the Winooski because — for a change — it was too high, only to be too low the next morning. I had class all morning Friday and convinced Brian Seitz and Sam Streeter to come look for something low enough to run in the afternoon. Our first stop was a waterfall I’d scouted with Brian at low water a few months earlier on a tiny creek called Sandusky Brook. At low water, there was a funky boof ledge a few feet below the lip and I thought you would either be able to run the boof or plug to the left of it at higher water. I didn’t anticipate how much higher the water would be, though. The low water scout. Note the rock above the lip at the top. We drove over the bridge over the creek and were all pleasantly surprised to see how much higher the manky drops at the bottom were than last time. 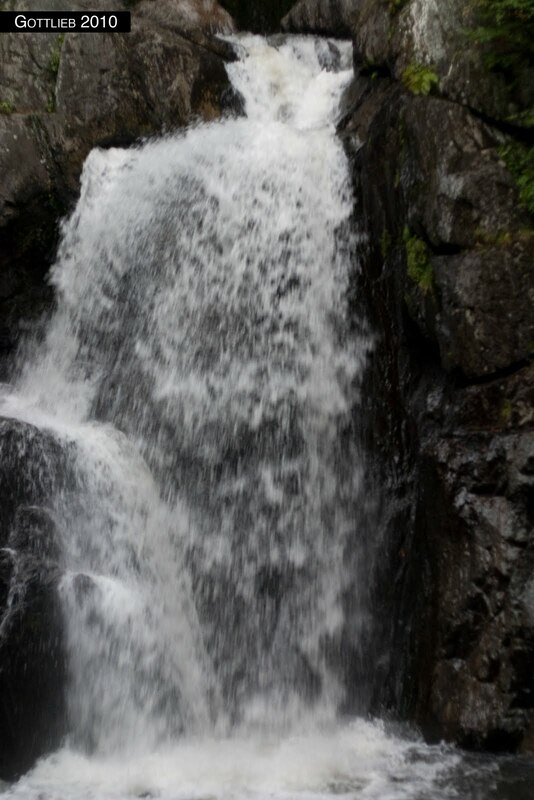 We then bushwhacked through the woods into the waterfall from the terrible dirt road next to it and were all a little surprised to see it higher than I thought it could ever get. The rock above the lip in the picture above was not a rock, it was a hole, and the lip started about that high — maybe five feet higher than it did at low water. And the boof ledge was even more strange looking than it had been at low water. And unfortunately, the left side had filled in so much that it was now pillowing off the left wall, and also extending so far left that part of it landed in shallow water. It’s kind of nerve-wracking when you need to change angle twice over the course of a 35′ waterfall. Photo Brian Seitz. The pool also flowed so rapidly out that there was no chance someone would get to shore if swimming, even with a rope, before the next rapid. 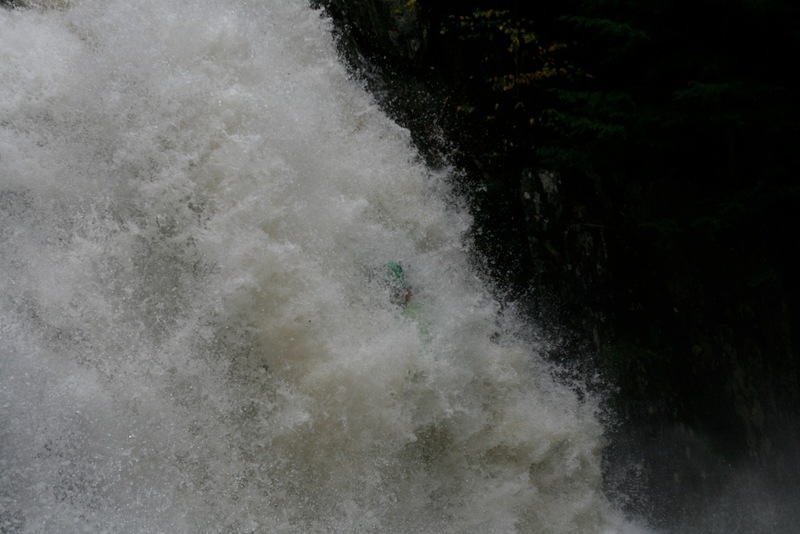 The first little rapid wasn’t terrible, but the one immediately downstream had a terrible rock and a nasty strainer. And the one downstream of that had an even nastier strainer. Knowing I’d rather have Brian and Sam on safety, I scouted the putin to make sure I could get in on my own and then sent them downstream. Brian ferried across to river right to set safety from that side, as river left was sheer walled all the way down to the second strainer. Once they were set up, I got into my boat, precariously perched on a log on shore and seal launched into a tiny eddy at the lip. I snuck out behind the rock/hole and went across to the right, catching the curler coming off the end of it and managing to nail my line, melting down between the pillow off the left wall and the weird boof on the right, landing upright. Letting the water turn me back left as I hit the pillow. Photo Seitz. 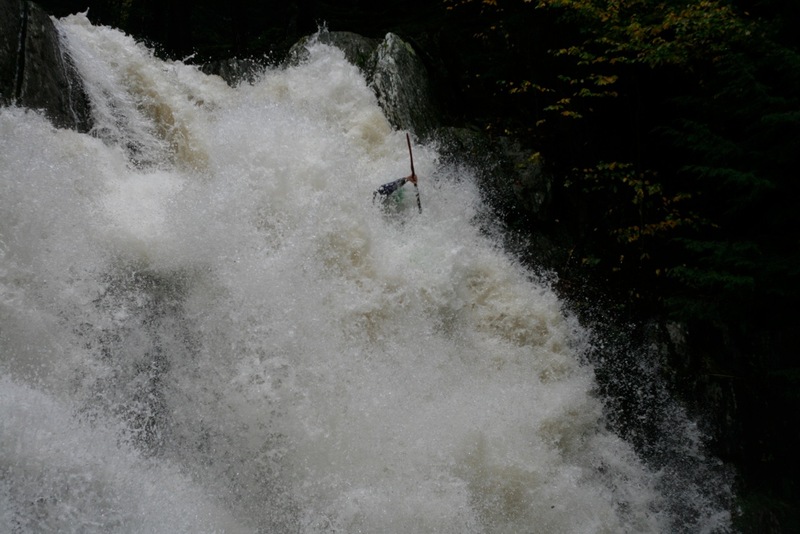 Lessons learned: definitely tuck your paddle to the side on drops this big. I was whited out and couldn’t really tell where I was top to bottom and didn’t manage to tuck in time and tweaked my arm as a result. Taking the stroke on my way down that turned me center/right so I didn’t piton. Photo Seitz. Afterwards, we headed over to Lincoln Brook to check out that park and huck, but it was so clogged with wood we couldn’t really run it, so we routed on down to Patterson, which turned out to be quite high. Brian got beat in a hole, rolled up and got out on shore and started hiking up to the road. Then dropped his boat into the river. 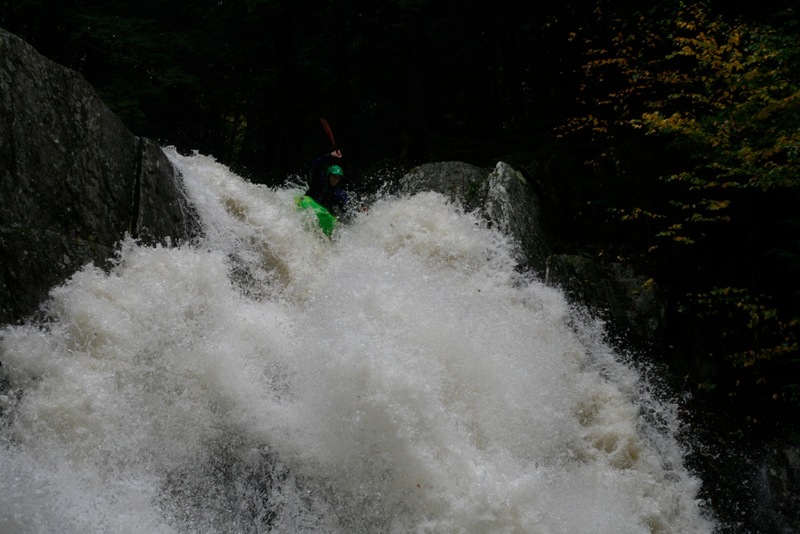 At which point I started chasing after it solo through some huge holes, eventually getting worked myself and deciding to just call it…only to discover that the takeout (and flatwater, where we definitely would have gotten the boat) was only a quarter mile downstream. Oh well, sorry Brian. Saturday, Ben Peters, Kevin McGregor, James Duesenberry and I ran the Upper Pemi, which ended up setting off my elbow tendonitis to the point where I haven’t really been able to paddle much (a lap on the Big Branch last week got it so painful I was groaning while running shuttle for the next lap). I’ve since gotten elbow braces that seem to be helping. If anyone has any experience with this and with curing it let me know…it happens by the end of just about every season. Lateral and medial epicondylitis — e.g., tennis and golfer’s elbow, both.